Description: Beauveria bassiana a naturally occurring friendly fungus in soil. which is effective against more than 150 pest species including Termite and White Grub in soil as well several foliar insects pests. Recommended against: Gram and pigeon pea pod borer, white fly, aphids, white grub, thrips, potato cut worm, termites, mealy bug, pod borer, teak defoliator, brown plant hopper, cabbage semi-looper, pyrilla and many other lepidopterous pests. Recommended Crops: Black gram, red gram, green gram,bengal gram, banana, tobacco, wheat, paddy, cotton, maize, barley, sorghum, oat, sugarcane, sugar beat, potato, brinjal, tomato, cauliflower, cabbage, onion, fruits, flowers & medicinal plants etc. Soil treatment: Field Application: Mix 1 kg Yash Beauveria with 50 kg of FYM in 3′ x 6′ bed, moisten and cover with polythene for 15 days (turn FYM and moisten 3-4 times), after 15 days spread over one acre land. For spray: With Suspend 1 kg Yash Beauveria powder in 400 liters of water and spray in one acre. Repeat the spray at 10 days interval depending upon the pest population. Under field conditions, the larvae may be killed within 7 – 8 days of the application. Keep Yash Beauveria always away from heat and sunlight. 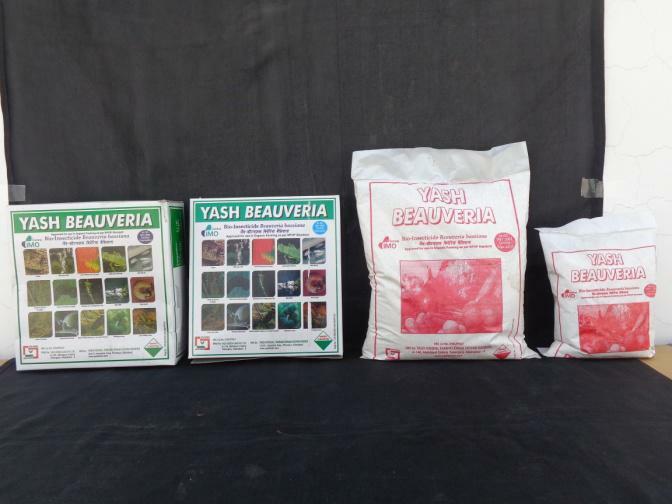 Don’t mix Yash Beauveria with chemical fertilizer or chemical pesticides. For best response of Yash Beauveria use with maximum organic manure. Effective against adults and larvae of many insects. Not toxic to humans, animals and birds.